Premium motorcycle carrier from Direct Aftermarket provides convenient hauling capacity to your vehicle. Carrier is great for hauling many different types of cargo such as scooters, dirt bikes, street bikes, sport bike, or any other items. Constructed of weather resistant epoxy powder coated tubular steel, this heavy duty hauler can hold up to 500 pounds and features a loading ramp carried on the hitch. Ramp is built so the bike can be loaded from either side. The rack measures approximately 76 inches wide and 33 inches long. Loading ramp is 38 inches long and 5 inches wide. Compatible with Class III or IV trailer hitch and requires a 2" square hole (NOTE: hitch pin not included). Trailer hitch pin is not included. 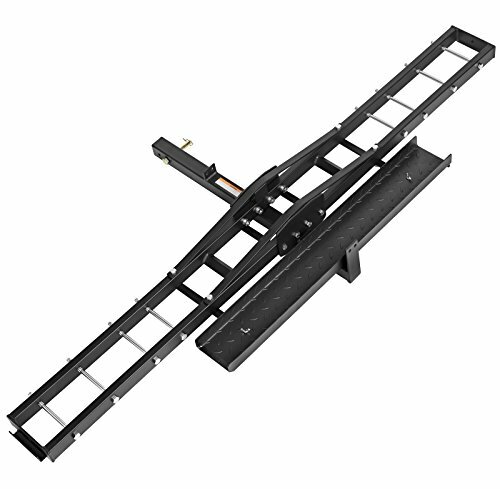 Includes: carrier, loading ramp, assembly hardware, and instructions.